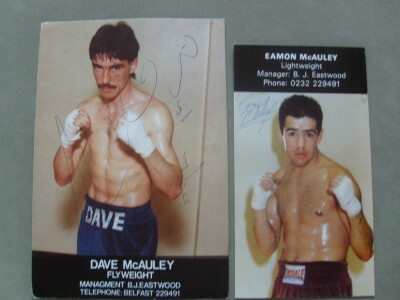 David Dave Boy McAuley had two fights in 1987 and 1988 in the King's Hall in Belfast against Columbian boxer Fidel Bassa, which were regarded as fights of the year. 3 minute video of their 1987 fight for the world flyweight title, and his 1989 Wembley Arena fight for the title against British boxer Duke McKenzie, which he won. He kept the title until 1992 and successfully defended it five times. 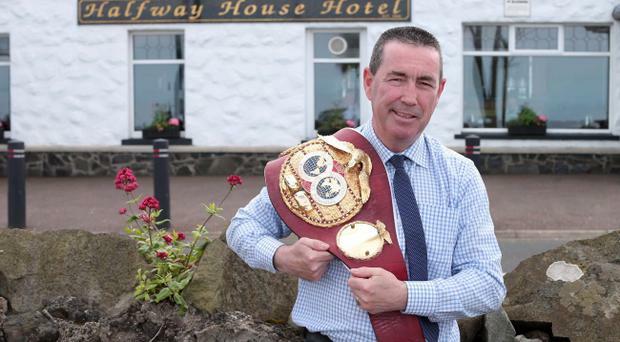 He was awarded an MBE in 1992, and he now runs a hotel in Ballygalley, near Larne, and commentates on boxing for RTE. He's 57 now, and he looks even better now than he did then. 2002 Manchester Evening News Arena, Manchester, Belfast professional boxer Eamonn Magee, and former British Commonwealth light-welterweight title holder, fights Ricky Hatton, for the WBU Light Welterweight Title, in what Hatton's trainer described as being his toughest fight. "I can’t help laughing with him before Magee continues. “I really did go to rehab and the only thing that _ _ _ _ _ _ me up was that you’re not allowed TV. Not having TV was worse than no drink. You’re better off doing six months in jail." William Hill Sports Book of 2018. It's tempting to say that boxing has moved on a few notches since this video and certainly the training facilities for champions has, but it's worth remembering that in London out of nine murder victims by stabbing in 2019, no less than four have been members of Newham Boys Boxing Club. It's still essentially a ghetto sport where the kids come from the wrong side of the tracks and for the few who make good, most are quickly forgotten, left with their own ideas of themselves as fighting men and often left to deal with mental health issues alone. What !!!,... that place is a famous boxing gym !,... those places usually produce the opposite of that sort of thing. ! People are ranting and venting about quite a few issues in the U.K. at the moment, but knife crime in London currently certainly seems to be a very real and uncontrollable and increasing epidemic. ! As for training problems, which Eamonn now does, or tries to, he has been having his own local problems with trying to provide training.